While precision agriculture (PA) technologies are widely used in cropping systems, these technologies have received less attention in mixed farming systems. Little is known about the nature, extent, and temporal stability of spatial variability of pastures in mixed farming systems and the feasibility of managing this variability. This paper describes a technique to create a Stability Index based on both crop grain yield and pasture total green dry matter (TGDM) production over time, using high resolution spatial data in two climatic zones of Australia. Four productivity zones were used to characterise the Stability Index: high and stable, high and unstable, low and stable, and low and unstable. Mapping the indices shows the location and size of the spatial and temporal features of each paddock. The features of the stability zones generally corresponded with soil texture classes. 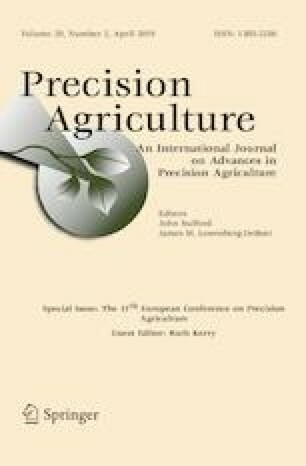 Testing the Stability Indices with a Kruskal–Wallis one-way ANOVA showed significantly different medians for high and low production categories for both grain yield and pasture TGDM (p < 0.01). Crop grain yield stability showed significant differences between medians. In pasture TGDM, the differences between stability medians were not significant, but the technique still separated medians into stable and unstable groupings. This production Stability Index has the potential to be used by farmers to manage spatial variability in mixed farming systems by identifying homogenous areas within a paddock for investigation/amelioration and can also separate out areas of either spatial and/or temporal instability for specific management strategies. The authors wish to thank Mr. Murray Hall (“Milroy”) and Mr. Adam Inchbold (“Grandview”) for allowing this study to be conducted on their properties and for their technical input. We also wish to thank Mr. Simon McDonald from Charles Sturt University Thurgoona for his statistical advice and Ms. Deanna Duffy for assistance with ArcGIS. This work was supported by the Australian Grains Research and Development Corporation through a Grains Research Scholarship (GRDC Project No 10042).